Want to improve the contours of your chin from every angle with a simple in-office procedure? We offer very natural-appearing chin augmentation procedures for clients who want a more defined chin and profile. Often combined with the TLC LiftTM (Lower Facelift & Necklift), the Chin Augmentation Las Vegas enhancement procedure will help add more angle and sharpness to your profile. It will also help to balance your facial proportions and harmony. Chin augmentation can be performed as a single procedure (or combined with neck liposuction) in younger patients who are in their 20’s, 30’s and 40’s. 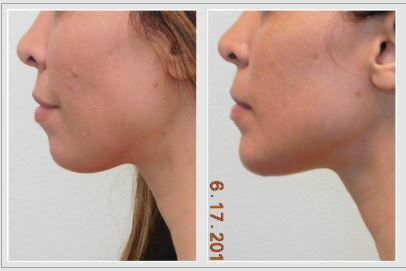 Chin augmentation takes under an hour to perform in our Center. A tiny incision (less than an inch in width) is made in the natural horizontal crease under the chin so that it is well-hidden. Usually, only a few stitches are needed to close the incision (they are typically removed after one week) so that it heals perfectly! We typically like to use a silicone extended anatomic implant in most clients. This implant is our favorite since it augments both the front and sides of the chin to mirror your natural structure and maintain the essence of your appearance. There are a few sizes to choose from based on the amount of improvement one desires. A chin augmentation could be a good fit for you if you’re seeking a long-term solution for a weak or under-defined chin. Dr. Lanfranchi is able to customize your augmentation to your aesthetic desires with a variety of silicone implants. Safely and effectively define your chin and jawline from every angle. Chin augmentation always has one of the highest satisfaction scores among patients. By creating a subtle aesthetic balance between one’s nose, lips, cheeks, and chin, this procedure is one of the best-kept secrets in Hollywood! Schedule an in-person consultation to find out if chin augmentation is right for you. Swelling is typically minimal with a chin augmentation procedure, and bruising is often not common. Recovery time (as any swelling post-surgical subsides) is usually only a few days allowing you to quickly get back to your daily routine. Full recovery can take up to several months as your new chin continues to “settle”. Dr. Lanfranchi will provide you with a custom recovery plan to facilitate a speedy recovery sans complications. Ready to learn more about Chin Augmentation? The first step is to come in for an in-person consultation with Dr. Lanfranchi. Please fill out the form on this page to request a consultation or call our office directly at 702-929-3880 during normal business hours (please leave a message if we are unable to answer). The Lanfranchi Center serves the Las Vegas and Henderson, NV areas.